Our mission at Joan is to help people book and manage meeting rooms simply and efficiently to maximize time and productivity. We understand the value of streamlining this process in the workspace and we strive to bring an integrated, smart solution to the enterprise. This is the same motivation that pushes our customers to adopt Joan as a business solution for their offices and why they provide us with constant positive feedback. We are in tune with their needs. In fact, we have taken this a step further. Today we are very proud to announce a collaboration that turns Joan into an even more efficient tool for managing meeting rooms. Today we turn smart offices into smarter ones and enhance employees’ interactions inside the workplace. Joan has teamed up with Alexa for Business to enhance employees’ experience in the office. Now, users will be able to find, book, and extend reservations of meeting rooms simply by using voice commands. 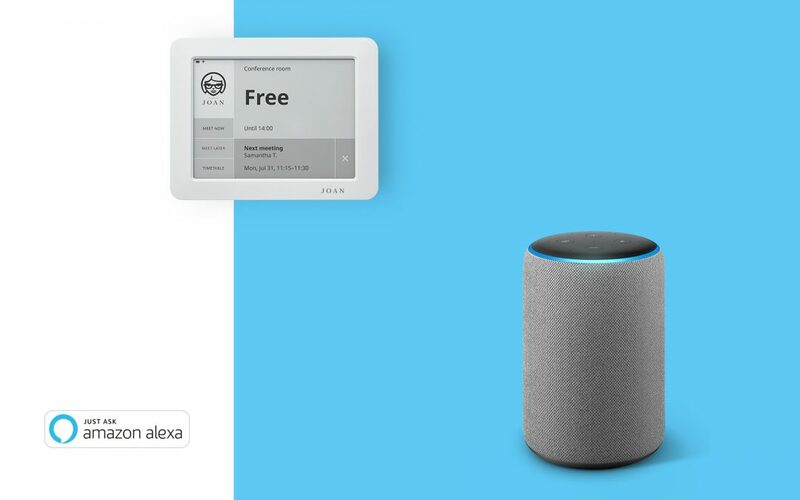 Currently, a handful of companies in the U.S. are using the new Alexa skill and taking advantage of voice-activated functions like “Alexa, is this room free?”, “Alexa, reserve the room for [duration]” or “Alexa, book this room at [time]”. This functionality empowers the users by giving them full control over meeting room reservations both from the inside (with Alexa) and the outside (with Joan). This feature adds to the 80,000 Alexa skills available today and specifically focuses on managing meeting room booking while expanding the possibilities for companies to make their offices more intelligent and accessible to employees. Our aim is to allow any organization to have more engaged, informed and empowered employees. It is proven that efficient office interactions lead to better job satisfaction, which in return fosters healthy levels of productivity and an overall improved company performance. According to Gartner, 25% of digital workers will use virtual employee assistants daily by 2021, which makes this collaboration between Joan and Alexa for Business an important and exciting milestone for the future of the smart office.